That could be a reglue to a slate of some kind that is usable. The glue used looks similar to what Ardennes uses, I would hazard a guess it is one of their older ones. You can get just a slurry stone from Ardennes or The superior shave. 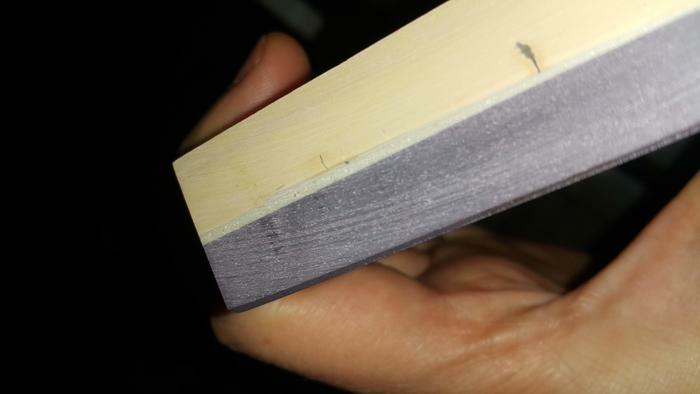 My preference for lapping coti's is to start low at 150 grit sandpaper if there is any serious dishing, gouges or chips that would effect honing. 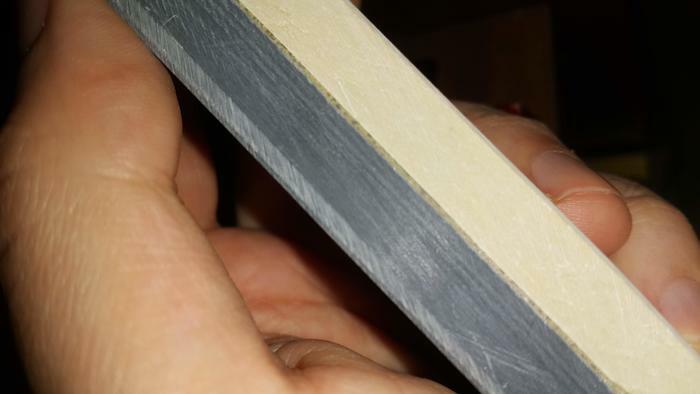 Then move up to 800 or 1000 grit. Some of the super hard ones will take a little longer. Then rinse the stone off under running water, rubbing with your palm to remove any stuck on grit or slurry. I try slurry here and there, but am never really that successful with it on any of my coti's. 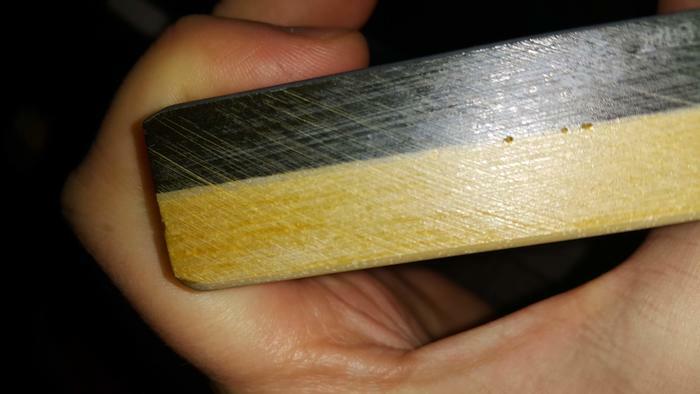 I get my best results taking a razor to an 8k and honing until the edge feels and sounds smooth over the edge. Typically 100-200 laps with a lot of water. 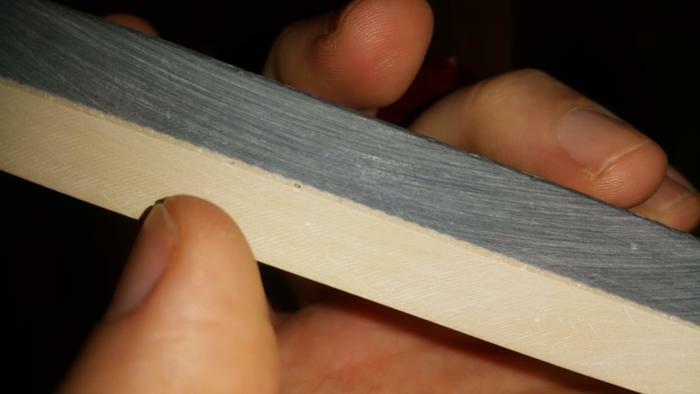 Looks like a Coticule with Blue Slate backer, the backer not intended for honing, so don’t waste time lapping. Most Thuringia stones are generally much thicker, coticule blue slate backers were thin, like yours. It was probably just re-glued. What are you lapping it with? A Coticule should lap easily with 320 -400 grit, a 300-400 diamond plate should easily lap it. Do not use sandpaper to slurry, you will get grit in the slurry, use a diamond plate or better, buy a coticule slurry stone. You can buy one for $10-15, just google coticule slurry stones. Learning a coticule can be difficult, because stones vary so much, and you are learning a completely different honing technique, (honing with slurry). It can be a challenging road, do not make it more difficult introducing a variable you can not control, (lose grit from sand paper). There are tons of good video and threads on honing on coticules, look them up. Coticule. Be is a good first resource from knowledgeable coticule user/experts. They can also direct you to a slurry stone vendor. Nice find, I use naturals after a well honed 8k edge. You can bevel set with this and other naturals, but why? I’ll get shot at for saying this (ducks and hides) but I don’t think that’s a coticule. 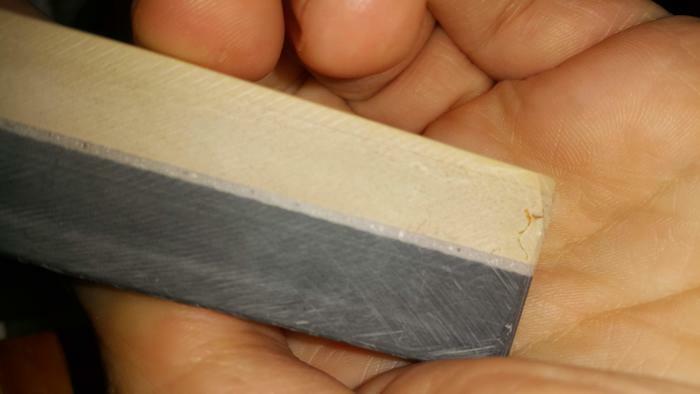 It looks like one of the synthetic barber hones that are glued to some type of slate. Some guys call them synthetic Cotis or man made Cotis. Whatever they are, they are very good stones. You can always confirm this by doing an acid test with something like CLR. But I’ve been wrong many times before, so holster your weapons. Maybe, I melted one once, a 2X3 when I sprayed it with Oven cleaner. Literally it just melted, I rinsed it off as quick as I could in a tub of water, then it just fell apart. I have a couple of the stamped Record ones made from coticules, 4x6 I think. 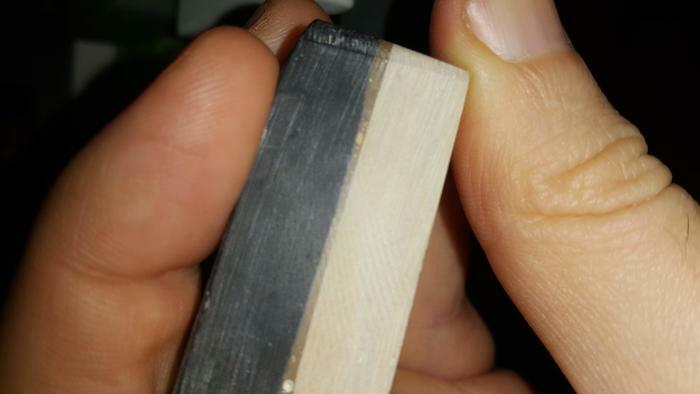 I have honed on them and was not impressed, I think they were more of a tool stone, chisels and plane blades, which is why they are stamped “Record”. Looking at the surface of the stone - Dcaddo could have been right. Looks somehow like the man made cotis. 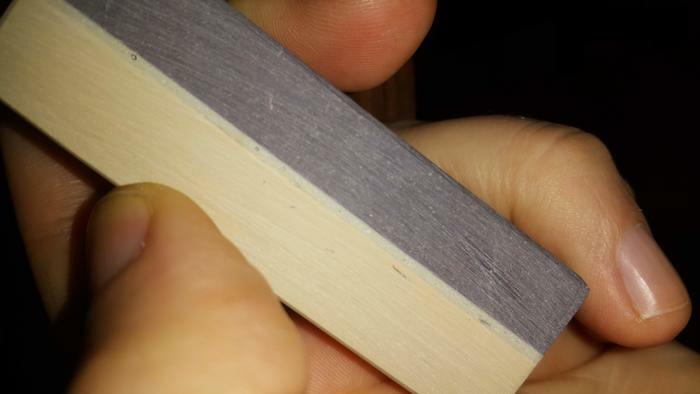 But lookign at the sides, you can see saw marks and you can see clearly the glue line and the glue. And the man made cotis have never been glued to slate as far as I know. onimaru55 and Euclid440 like this. The stones I am speaking of (whatever you call them) all have those straight up and down saw marks, and if you look closely, the saw marks on the lighter side and the slate will line up. I believe they were poured on top of the slate and then cut to size. I have several here but they are in storage. I’ll see if I can drag one out tonight. Euclid440, Steve56 and Toroblanco like this. If it's something like this, chances are it's a coticule. These are 7 different stones. AC, variuos belgischer brocken, some newer, some older. The variety of the backing (mostly slate/black shist here) is pretty much non existent. Thing is, unless all started to pour coticules from something, the saw marks could be irrelevant. Some finish them, some don't. My guess is that they cut them after making big chunks anyway and they even sell the leftovers. This being said, man made black and white stones (this is how I always knew them) are real. It's hard to tell from those images alone. Hi neighbor! Good to see you. Howdy, Steve! Enjoying this wonderful weather? Lol.